Sharps Containers: What are they for? Where do you get them? Sharps containers are specially made containers used to contain sharps waste, but where should you purchase one? Medical waste requires its own set of disposal containers, and there are many, depending on the type of waste being discarded. There are general biohazardous containers, red bags for red bag waste, and of course sharps containers for medical waste that is considered sharps waste. 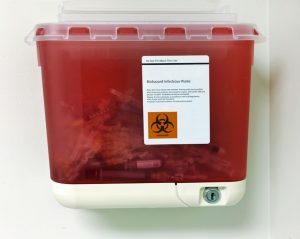 Sharps containers are specially made containers used to contain hazardous piercing instruments, to reduce the risk of injury and spread of infection. A sharps container is predominantly used for medical needles and any other sharp medical instruments, such as an IV catheter. Of course, sharps themselves aren’t just needles. The term refers to any item that is capable of puncturing the skin; this includes syringes, lancets, and scalpels. Because these instruments may contain disease-carrying blood or other potentially infectious materials on them, they are capable of spreading that blood or fluid into anyone who comes in contact with them. That is why sharps containers are a must for facilities that deal with sharps waste. When determining the specific type and brand of sharps container to purchase, you should factor in the cost of sharps injury prevention for your facility beforehand. Cheaper isn’t necessarily better. The CDC covers this extensively on its resource page for sharps safety and injury prevention. According to the FDA, used needles and other sharps should immediately be placed in FDA-cleared sharps disposal containers, which are available through pharmacies, medical supply companies, and health care providers. Perhaps the easiest way to acquire approved sharps containers is by working with a certified, responsible, and safe medical waste disposal company such as RedBags.com. To better facilitate the storage and transportation of your medical waste, RedBags.com can provide red bags, boxes and bins, and sharps containers. Our compliance teams work diligently to assist customers in understanding how to avoid hazards and risks commonly encountered in medical waste disposal, including disposal receptacles. Contact RedBags.com today to discuss service options, as well as medical waste receptacle offerings to keep your facility in compliance and mitigate risk.